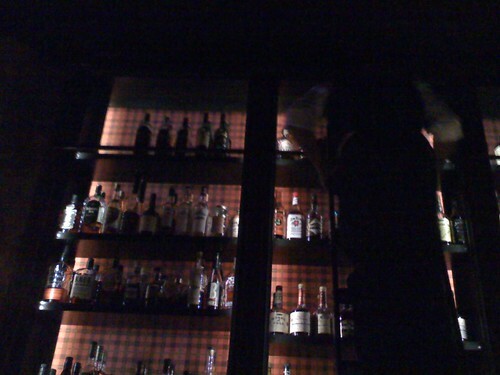 I’d like to echo earlier remarks here about how downtown’s new whiskey bar, Seven Grand totally rocks. I went there with some friends the other night who decided they needed to relocate their offices to a corner inside of the bar. For people who are interested in drinking things other than “house whiskey” the menu at Seven Grand is extensive. Including several top shelf options, which they actually have on the top shelf. Of course the subtle details are really what make the place so comfortable to hang out, even if you aren’t partaking in the hooch. The lights were dark, but not so dark you couldn’t see. The music (which while I was there consisted mostly of The Pogues, The Pixies, and The Clash) was just loud enough to be background, but not so loud you needed to speak up to talk to people sitting next to you. And if all that isn’t enough, there are a selection of flat screen’s around which were showing Russ Meyer flicks followed up by Sergio Leone screen gems. Finally, there is one of the nicest billiards tables I’ve ever seen in my life square in the middle of the room. I’m going to go ahead and throw in a vote right now that the next blogging.la meetup thing we do be housed there. Any seconds? too funny. i was there wednesday night and last night and posted my own brief thoughts on the place afterwards. agreed. it’s pretty damn great. It’s on my list of places to check out – but are there stairs? I have a cripple in tow for a while. There are, as it’s on the 2nd floor, but they are short flights and very wide, if that makes any difference. seven grand has an elevator for handicap usage. Just ask the bouncer out front to use it.